The Navy Medal of Honor is born! You could say that the Medal of Honor came about as a result of a good spanking. That spanking took place just 32 miles south West of Washington DC and along the Bull River in Virgina close to the city of Manassis. It was here in July of 1861 that ill trained Northern troops tackled ill trained Confederate troops. A thousand men would fall to wounds or death or would be captured in an hour. And the same numbers would be repeated for each of another four hours. When all was said and done the First Battle of Bull Run, or Manassis was over and the Confederates had given out their spanking to the Union troops who high tailed it off back to DC. Had the Confederates better leadership they might have pursued the Union soldiers and today what lies to the south of Canada might have been called the Confederates States of America. The humiliation and the demoralizing affects were no doubt on the minds of the United States Congress and both houses were clearly looking for ways to jack up their troops. At about this time Brig. General Edward Townsend, pictured on left, was the Assistant Adjutant General of the Union Army. One of his roles was looking out for the welfare of his troops. He and others thought it was time that a medal be created to motivate the men to do better on the battle-field. He brought his idea to Lt. General Winfield Scott, pictured on the right, but Scott, who was the top army General, would have nothing to do with the idea. So Townsend then took the idea to Edward M Stanton, pictured of left, who was the Secretary of War, and he liked the idea. He did not want to offend Scott, so he asked that the matter be treaded lightly. But another fellow in the room that day did not worry about offending the army general. because he was the navy top man... his name was Gideon Welles and he was Secretary of the Navy. By Late November or very early in December of 1861 Welles was making it known that he wanted a medal for the navy. He soon received support from Senator James W Grimes from Iowa. He was then the current sitting chair of the Senate Naval Committee and no doubt had considerable interest in any thing to do with the operations of the navy. On 6 December Grimes, pictured on left, introduced a Bill in the Senate called "a Bill to Further Promote the Efficiency of the Navy." It only had 8 sections dealing with rates of pay, retirement and seniority provisions etc. At section 7 he added in this jem... "That the Secretary of the Navy be, and is hereby, authorized to cause two hundred medals of honor to be prepared, with suitable emblamatic devices, which shall be betowed upon such petty officers, seamen, landsman, and marines, as shall most distiguish themselves by their gallantry in action and other seamanlike qualities during the prescent war, and that the sum of one thousand dollars be, and the same is hereby, appropriated out of any money in the treasury, for the purpose of carrying this section into effect." Changes to the wording would come over the weeks and months to come. And on 21 December 1861, 151 years ago today, President Abraham Lincoln gave birth to the navy Medal of Honor by signing the legislation that created the medal. Of the 3,468 Medals of Honor issued from that date, 1,045 of these would go to men of the Navy, the US Marine Corps and one to the US Coast Guard. And that one would go to Douglas Munro who was born in Vancouver, BC, Canada. Only 1 in 2,105,263 earned 2 Medals of Honor! There have been 40 million who have served in the US military. Current figures suggest, but are wrong, that there have been only 19 servicemen who have been awarded not one but two MOH's and are termed double recipients. 40 Million divided by 19 provides the above number. Today's story is about one of these double recipients. He was a navy man who most will say was born in Montreal, but in fact he came from Montserrat in the West Indies. He is the only known black recipient to become a double recipient. I say known because more information comes available on a regular basis. An example..just a few days ago I became aware of a historian's recent discovery that a recipient previous thought to be white, was a black man. This, despite all other available sources not so indicating. More on a future blog on this. His medal aside, usual sources tell us that there are about 85 listed Black Medal of Honor recipients, many dating back to Civil War days. The hero of this story earned both during peace time and for saving lives from others who had fallen overboard from a warship, could not swim and were about to drown. About 86 medals were issued to navy men for the same form of bravery, and naval provisions provide for such awards that did not need to be in the face of the enemy. Our man's name is Robert Sweeney. No known images of him seems to be available. He enrolled in the navy in 1873 and served on a number of vessels before finally retiring from naval service in 1893. On 27 Oct 1881 Commander GB White sent a handwritten note to Secretary of War WH Hunt telling of a cadet officer and Seaman Sweeney's heroism on 26 October. While at the Navy yard at Hampton Roads Virginia, a seaman by the name of EM Christtoveson fell overboard from a jacob's ladder, Sweeney dove in to try and rescue the lad. He could not swim, was in a panic, and pulled Sweeney under twice and it was then that the cadet jumped in with a rope to haul both out of the water. The commander noted that...it was a brave and plucky act" and ... "to their bravery and prompt action we owe the life of one of our crew." The commander commended that the Secretary of War give them due consideration. Early words meaning they were both being recommended for the Medal of Honor. Only days later... on November 1 the Secretary issued a general order announcing that the department very highly appreciated the bravery of both men and that the later... Sweeney... had been awarded the Medal of Honor. Two years later, and now at the navy yard in New York, Robert Sweeney would yet again dive into the water to save a shipmate. This time he dove of the decks of the USS Jamestown to save apprentice AA George who was attempting to walk a plank between 2 vessels and fell overboard. He was later recommended for a second medal and by the end of December it was awarded. And that act of bravery occurred 128 years ago today... on 20 December 1884. Robert Sweeney was born in 1853 and died at only age 37, in 1890. The records indicate that only 8 sailors in the entire history of the medal became double recipients. A future blog will argue there may well be four more. Turn any radio on and you will here the wonderful voice of Pery Como or Bing Crosby or Johhny Mathis or Michael Buble singing this charished song. It was written by Meredith Wilson and believed to have been while staying at a hotel in Yarmouth Nova Scotia back in 1951. But today has this week looking a lot like Christmas for me. I got a wonderful present to share with you today. Fact is that it seems just about every week in the last year has brought me more presents. Presents that help to preserve Canada's history and adds just another tidbit to the stories of all the medal of Honor recipients I am researching and writing about for my book. And just like the quote "a man is only as good as the woman behind him," so goes my story. In the past few years the woman in this story has followed my path. Actually, she has really walked along side me. And the more articulate would say there were times when I was following her. Now you might say that this is not a very good picture of her and I would agree. It is actually of James ALLEN whom history seems to have only recorded living for a short time in Canada before heading off to the US and fighting in the Civil War. I suspect his earliest Christmas days were difficult at best. He had arrived in Canada as a baby from Ireland and by aged five was an orphan. History has yet to release eactly where in Canada he was, but it does reveal that in his teens he had already arrived in the United States and would soon be in the midst of battle during the Civil War. Having to think very quickly, he hollered out for help from his companions whom he knew full well were no where around. He also told the resting troops to get up on their feet and pile the rifles in the middle of the road and best do it NOW before his friends..and very mean bunch... arrived. The enemy to a very man did as instructed. Then Allen wondered what the hack he was then to do. Luckily his Colonel was off in the distance and saw him standing there and directed that his company commander come to Allen's help and take charge of the prisoners. (His company commander would later earn a Medal of Honor and would end up as a Brig. General. And he was also a Canadian. Allen then secured the colours and took them back to the HQ, presented them to the General and was promoted on the spot to Corporal. So what's this about an xmas gift ? For the past twelve years I have been on the hunt to locate the actual medals of honor that these Canadians have earned. I have located a handful. When they cannot be found I try to at least find out what is inscribed on the back of the medal. Ciations are relatively easy to locate in most cases, but not so for what is exactly on the medal. Well, in the article Diane located it says that James Allen's Medal is inscribed with the words... "The Congress to Private James Allen, Company F, 16th New York Volunteers, for bravery at Campton's Pass (sp) South Mountains, MD, Sept. 14, 1862." This is a lot to be inscribed, but that is what the article says. So folks, there is your xmas present. Sorry for all the wrapping ! And as my late mother would always say...save the wrapping, you can use it again next year. How many times have we all heard that when you go looking for trouble, you are most likely to find it? Lets step back a few years... actually a lot more and go back to 1868. It was in that year that the US government came to an agreement with the natives with the Fort Laramie Treaty. In this, the Lakota Indians were promised that everyone would leave them alone on a large chunk of land that would become known as the Great Sioux Reservation. Government then ordered the natives to move away from the more prosperous areas of their treaty lands and ordered to relocate to a selected area that was less suitable to their needs. They were given until the summer of 1876 to make the move. Failure to comply meant they would be treated as hostile and rounded up by force and escorted to these lands. Hostilities would soon break out when the white man found them doing buffalo hunts and gathering in very large numbers. Push would soon come to shove and eventually the army would pit about 1500 against 1500 natives in the Battle of Rosebud in Montana. It would become the largest encounter on record. In a 6 hour battle the military would lose about 50 to wounds and death but the natives only lost half that amount. Not including the 150 dead horses. The natives were pushed back several miles. The soldiers had almost exhausted their supplies and had expended over 25,000 rounds of ammunition. They were also quite exhausted even before the battle having just finished a very long forced march. So their commanders decided to back off, return to their base and resupply. Weeks later many of the same natives were in battle again. History would record this as the Battle of Little Big Horn. 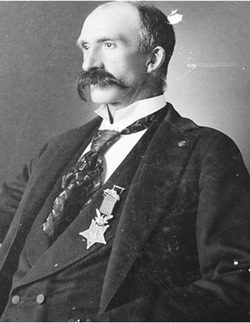 In the earlier battle Joseph Robinson, from Montreal Canada, (pictured above) serving as a First Sergeant with the 3rd US Cavalry would earn his Medal of Honor. While information is difficult to locate it seems that during a portion of the battle the horses were kept back. At a critical point in the battle he would play a strategic role in having them brought forth, and controlling the line that would lead to turning the tide in the battle. Research is incomplete but it appears that Robinson served from 1866 until 1893 in the 3rd US Cavalry then remained in the Leavenworth area and fought his last battle... for a breath of air...95 years ago today..on 18 Dec 1917. He is buried at Fort Leavenworth National Cemetery in Kansas along with other 3rd Cavalry colleagues, some also having earned the Medal of Honor. But first, I would like to thank those who have offered kind comments on the site. I am VERY VERY VERY new at this and will try my best to bring you stories daily that will contain information that is not widely known about the medal and of course the connection to Canada. Please continue to visit the site, for these daily blogs and feel free to leave comments. With regard to one sent in about the classes of Medals of Honor, while there have been several physical changes in the appearance of the medal, and its suspension ribbons over the years, all medals are equal in class. In other words all are of the same level, regardless of the reasons for, or methods involved in its presentation. Clearly some would be for events far more brave than others, but none the less most passed the tests of the day to meet that bar. And while on point I should note that the criteria itself has evolved over the years and changes have been for the better of course. Many had medals revoked years after being awarded, when criteria for current awarding changed. But I will have an entire blog on this subject at a future date. Watch for it because it will make some squirm around in their seats. If you scroll back to yesterday's blog you will see the navy medal being suspeded by the navy anchor. Here you can see the army version for the Civil War with the same ribbon and medal as the navy version but now it is suspended by an eagle resting on 2 cannons and 8 cannon balls. The original flag, according to General Washington, had stars representing heaven. The 13 stripes here are thought to have represented the 13 original colonies. The red coming from the Mother country, the white strips between each red showing that The US has separated from the Mother country, and the white going down to properity in representing liberty. The five pointed medal, always with one pointed down, contains a circle of 34 stars, one for each state before separation. Within this circle is the figure of Minerva, Roman goddess of handicrafts, the professions, the arts, and later the war. There is an owl perched on her helmet which symbolizes wisdom. In her left hand she holds tha fasces, a badge of authority, .. and in her right she holds the shield, symbolizing the Union of the States. This is wielding off the serpents held by the crouching figure of discord. In 1866 a fraternal organization was started as a place for CW veterans to gather and share their experiences and fellowship. The group was called the Grand Army of the Republic (GAR) and had Departments located in every state of the Union. It also had those broken down in many posts within each state, and in fact Canada and elsewhere. In the 1890's the fraternity had a membership of close to half a million strong. Generals and Presidents, Admirals and privates, and all in between qualified for membership as long as they had served in the war. It's first Commander-in-chief... John A logan issued an order that compelled all members to properly decorate all veterans graves with wreaths and flowers on what he called Decoration Day. Today it is known as Memorial Day in the US. When the last member died in 1956, it shut its doors, But since then its work has been taken on by a group still in existence and going strong today...The Sons of Union Veterans of the Civil War. The GAR Badge of Membership is pictured above. At a quick glance, it is often mistaken as the Medal of Honor. In fact so many got confused, it was decided, among other reasons to revamp the Medal of Honor itself and soon new models were created and issued. More on that in a future blog though. Sailors in the early days were sometimes awarded their medals in a formal presentation on board ship or back at their home port. But often Medals of Honor came via US Post and sometimes they would arrive many years or even decades later. When an announcement was made by the government that the president had awarded the medal, the announcement would be in a form of a General Order, with a specific number and date. Sometimes these very orders directed that formal presentations be made and the exact circumstance be read aloud as to the bravery of the individuals being recognized. Sometimes the very orders say that while the medal has been approved, it was up to the individual to actually apply to get it, and this would be passed up the line of command till finally getting to Washington DC where it would then be sent off. Medals would usual come in a presentation box as seen here. I have seen some with the individual's name printed right on the front of the box. Finding CW medals today is a difficult task. It is even more difficult to find one like that pictured here complete with the box. Most boxes have long since disappeared. Note the printed crest of the manufacturer Wilson and Son of Philadelphia inside the lid. The white ribbon seen here is to allow the medal to be properly lifted out of the box without damage to the box. The medal pictured is suspended by an anchor, thus being the navy medal. The ribbon above is the CW era ribbon. This ribbon design changed in 1896. The medal pictured on the left is the design of the first navy medal. Look closely at the anchor schaft and you will see fouling wrapped around the shaft. Compare it to the same era navy medal on the right. But this one came out just a little later and the version had by then dropped the fouling, possibly because of the costs involved in making it. Thus, the medal of the left is more rare and a more valuable. But keep in mind that in the United States it is illegal to either buy or sell a Medal of Honor. Pictured here is an enlarged photo of part of the medal. This one is actualy the medal belonging to a Spanish American War hero by the name of Blume. The photo was one taken by the FBI, for evidence in a case against a fellow from Canada who went into the US to sell a few of these medals, via the internet. He was arrested, charged and convicted of selling, which... as above noted, is illegal in the US. The FBI most graciously provided me with several of these photo's as the recipient was involved in the same battle that several Canadians were involved in and would have the same inscription on the reverse as those presented to Canadians, that at the time, I had yet to locate. Most intersting, in the photo you can see the name of Mr Paquet inscribed. He was the US Mint's sculpturist who designed this model of the medal. Every once in a while you may here the model being thus called the Paquet model. The next blog will talk about the army version of the CW medal and then I will talk briefly about the designs on both and the meaning of the stripes on both models. Of the 40 million having served in US uniform, only one apparently went from Private to Colonel, got court marshalled, served in the military of three different countries, fought in three wars, and was awarded a Medal of Honor. Well folks, that's what Lewis Lee Millett did. That and much more. The United States has to be very proud of this hero. Lewis Millett followed the tradition of his forefathers in serving his country by enlisting in the military in their time of need. Matter of fact he enlisted even earlier... while still going to high school by joining the National Guard in Massachusetts. Kids would often ridicule him for wearing his uniform and they so teased him about his patriotic feelings that they pressured him into going into full time service. So he did. He enlisted with the US Army Air Corps and took gunnery training. But soon after joining up the US president made an announcement that there would be no American blood shed in the war going on in Europe. The US position at the time did not involve "boots on the ground" to supress Hitler's advances on the free world. Livid at the announcement, Millett deserted his post and hitchiked to the Canadian border with a friend who had just been released rather shamefully from the US military. Their plan was to join the Canadian army and head off to war. But Canada had other plans. It refused entry into the country to these teens..both in uniform. So the boys returned home, got a change of clothing, using the uniforms to again aid in the treck back to the border. Millett's friend turned back just before getting to the border. Stopping just short, Millett decided to bury his uniform, don civilian clothes and then try the entry. It worked. (Years later Millett tried to find the uniform and couldn't. ) After being accepted in the infantry, he was sent off to a New Brunswick recruit training camp. Here his basic infantry training included bayonet training that he had not yet had in his American service. Training that would become critical in his years to come. Soon word came down that he had been selected with a few others who were to be shipped off to Ottawa for some very special top secret training involving a new invention they called Radio Detection and Ranging. Today we simply call it... RADAR. Successful completion of this soon saw Millett sent off to England where he became involved in anti-aircraft radar duties. While In London, the American government finally decided to enter the war effort. Millett then switched back to the US uniform and found himself enroute to Aftrica, where within short order he became a war hero... for the first time. When a loaded tanker of fuel caught fire near a large body of troops, he jumped in and drove it off a safe distance and jumped out just before it blew up. He would be awarded the Silver Star for this bravery. While there he no doubt called upon his anti aircraft training in Canada when he shot down a plane from the back of a truck. But then his war record caught up with him. The authorities finally realized that he had deserted his post back in the United States, but now they had a problem. What to do with a war hero deserter who was just promoted to Sergeant? So after much thought, they tried and convicted him and gave him about a $50 fine and told him not to do that again. He didn't. Weeks later he was commissioned a 2nd Lt.
After WWII Millett returned home and went back to school, and after three years was called up for service in Korea. Now commissioned as a Lieutenant, he would learn as a platoon commander that the enemy thought the Americans were not brave enought to get involved in hand to hand combat. Infuriated with the insult, he took every chance he had to practice his platoon in bayonet tactics, whilst most around him thought he was a little strange. At Hill 180 Millett's platoon came under heavy enemy fire. He decided he must do an uphill bayonet charge and led the way to a victory by having the entire platoon engage in hand to hand combat and the tossing of grenades that left the hill scattered with about 50 enemy dead and the rest retreating. At least 20 had bayonet wounds. Millett would be awarded the Distinguished Service Cross for this. He would repeat the process a few weeks later and this time would be awarded the Medal of Honor. Still later in Vietnam, Millett would act as a military advisor and intelligence officer and would play a major role in setting up commando schools both there and back in the US. He would retire in 1973 as a full colonel and passed away a few years ago. I had the piviledge of meeting Colonel Millett's son and daughter-in-law whilst attending Millett's funeral at Riverside Cemetery in California, at their invite. I further visited the family home and felt like I was sitting in a military museum with pictures of the Colonel with several presidents and letters of best wishes from several generals all around me. When asked where his office was, I had a shutter go up my spine when told I was sitting in it... being the livingroom chesterfield, and exactly where I was sitting. I was permitted to see and hold his Medal of Honor and other medals but the family insisted I go through a medal detector before leaving the house... hehe. The author holding Colonel Lewis Millett's Korean war version of the army Medal of Honor. Millett was very proud of the fact that he was court-marshalled and also went on to earn the Medal of Honor. He was equally proud of the fact, and often made note in conversations, about the fact that it was his Canadian training on the bayonet that led to the instruction he could then pass on to his platoon, and resulted in part for their incredible heroism in Korea. He was also very proud of the three service medals Canada awarded him for his stint in the service in our military. While the US Government would not allow him to hang the Canadian medals on his uniform, he apparently wore them anyway... hidden under the yank ones held in place by velcro ... so the story goes. Millett's son Lee Jnr is also a courageous Vietnam veteran and actually served at the same time as his father. On return to home Lee Jnr was commissioned as a sculpter to create a lasting memorial, which is now a National Memorial at Riverside for those POW's and MIA's from that war. Many missing to this day. Another son served with honor in the 101 Airborne and lost his life with 255 other passengers on a flight returning from peace keeping duties and hoping to be home for Christmas with family and friends. The nation and the 101 Airborne lost 236 heroes that day. It was the worst airborne accident in Canadian history. It's causes are still in dispute. If the Colonel is reading this today, happy birthday sir. All North America salutes you today, on what would have been your 92nd birthday. That's a lot of candles sir! What can you expect from a teen who runs away from home, walks some 80 miles, lies about his age and fakes being an orphan? Apparently a lot! Wesley James Powers was born at Oron, Canada West (Ontario) in 1845. By the age of 4 or 5 he went off with his family to Illinois and settled in St. Charles in a small village started just a few years earlier by other Canadians and called...get this... Canada Corners. Farm life did not meet with all of Wesley's needs so in the early 1860's he snuck off to join the Civil War effort whilst only 16 1/2 years old. Much to his parents shigrin, and after many efforts to prevent his enlisting, he finally ran away from home. And kept running! For another 80 miles till he ended up in Wisconsin and in front of a recruiter who accepted his lies of being 18 years old and that he was an orphan. Over about the next three years he would soldier in 3 different regiments. At his first he would be trained at Camp Kane, which stood on the grounds of Montreal born John Farnsworth. John was one of the founders of the republican party, was a good friend of a fellow named Abe Lincoln, and would serve during CW years as a general for the Union. (As did several other Canadians.) Camp Kane would also be the training ground for a fellow that would later claim fame as the soldier firing the first Union shots at a place called Gettysburg. Wesley was wounded in battle, sent off to recover, would later return to his first unit but found unfit for further service and released. Not accepting rejection he simply went on to join a 2nd... and still later a third regiment. It was here with the 147th Illinois Volunteer Infantry where he would find himself serving as a corporal in many battles including at the Oostanaula River. This Union regiment found itself blocked from advancing with no means of crossing the river and doing battle with the Confederates on the other side. Wesley could see that a ferry moored at the other side could carry the troops over to do battle. He then volunteered to swim across, secure the ferry and return to load the troops for the crossing. Under heavy fire he swam across but then found the ferry to big for one man to handle. Grabbing a a small skiff he piloted it back, got as few more volunteers, returned and then captured the ferry, all still very much under fire. Successfully again returning to the Union side, his unit then crossed and captured valuable enemy ground and pushed forward in the battle. Wesley survived the war, returned to Illinois, married and had one daughter. He worked in the moulding business for years and at an early age in life, only 57, in 1902 he died whilst employed in the ice making bussiness. Exactly 110 years ago today! The story of the Medal of Honor, (and thus that of the Canadian connection) begins back in the Civil War days of 1861-1865. I expect tomorrow to post a page with information about the Canadian recipients buried in this country, any memorials dedicated to them here and provide some tidbits about actual medals that are known to exist today in Canada. But today, in advance of these details I thought I would talk for a few minutes about many graves of the dead soldiers and sailors of that era. Many that are simply marked with the sad commentary that the name of the deceased is unknown. During the war the US government did not issue any form of identification to most that went off to war. Neither did the officials of the day expect that the war would go on as long as it did, or that they would be faced with such horrendous and ongoing casualties. Men seeing the dead and dying around them turned to their own means to try and leave some form of identification of their body in the event that they would die of disease or war injuries. Some would scratch their names onto their leather belts. Others would try and stitch in their names or simply write them on pieces of paper and affix these somehow to the inside of the uniform. But with the ongoing battles the dead were left where they died in the hopes that within hours or days they might, at the very least, be buried along side the battlefield. Some would end up simply in mass graves. Later attempts to identified the men were obviously near impossible. A perfect example of this is the story that you will hopefully read in a future blog about Ontario born Denis Buckley who was killed in the Battle Of Peachtree Creek in Georgia and buried at the site of the action. Later his remains were moved to a final resting spot, but he was buried under the WRONG NAME, and remained so buried for 140 yrs until just a few years back, and after considerable reaearch, a US historian found his grave and took steps to have a new correct marker unveiled. Some more industrious men carved their names on coins and drilled holes so that they could be affixed to uniforms or worn around the neck. Others often bought a dog tag that a sutler made on the spot in the camp. This would usually include the fellow's name, (hopefully the right one as many signed up under an alias) his unit and sometimes his home of residence at the start of the war. The above pictured dog tag was purchase by Mathew Elslager who was a cooper by trade and was born in New Brunswick. At the age of 36 he found himself in the US and joining the 1st Maine Heavy Artilery were a number of other Canadians also served. One even went on to earn the MOH, but I'll save that for another blog. Mathew served his 3 yr term and survived the war. Many others did not. Having failed to get..or lost personal identification, the resulting number of unmarked graves in the National Cemeteries of the US alone is alarming. A recent figure of the net tells that there are 325,230 soldiers or sailors buried in these government cemeteries. And of these almost 148,883 are unmarked graves. There are no doubt many more that are buried in private cemeteries all across the United States. Tomorrow I will post images of the known graves of the Medal of Honor recipients buried here in Canada.